Mukami Mwaura, the wife of nominated senator Isaac Mwaura has penned a touching tribute to one of her two children who passed away in 2017. The couple was blessed with triplets, two boys and a girl a few months after their wedding. 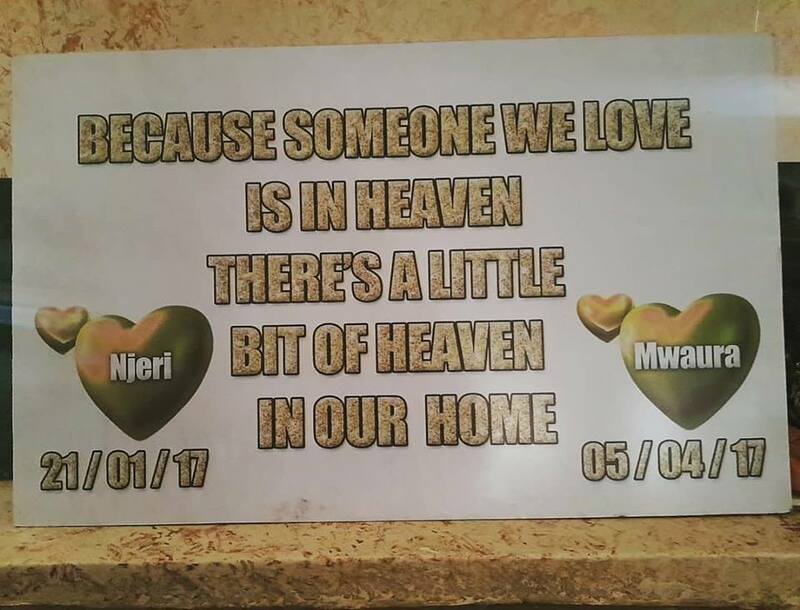 Their daughter, Njeri, passed away on January 21, 2017 then shortly after on April 5 – today is the second anniversary – they were heartbroken when their second child, a son passed on. They had named him Mwaura. In an emotional post, Mrs Mwaura paid tribute to baby Mwaura. Two years ago … I got a call at 8am from Nairobi hospital NICU asking me to rush to the hospital. I asked how my baby was doing … the nurse kept quiet for a few seconds then she told me my baby was still in critical condition but she would rather that she talks to me in Person. I knew what she meant. I knew my son was no more. 69 days of pain and suffering, with a heavy heart and overwhelming sadness I also felt some relief; that my baby wouldn’t have to go through all that suffering. I knew he was in a better place. He is forever a beautiful gift to us… We will always remember him in our hearts and in his little brother we are reminded that Gods brings no sorrow with his blessing, so we rejoice at the gift of a baby who was too beautiful for earth. She accompanied the post above with this picture. Mwaura and his wife Mukami are always emotional when talking about the loss, which was the lowest moment in their life. Mburu Mbau Martin May the two angels continue resting in peace. Clare Lai Nonsi So moving. May they always bring a Little bit of heaven to your homes and hearts. Christine Ngina I applaud you for being able to speak about this and making people aware of the toll it takes on anyone that has experienced child loss. For me it numbed me. May your angels rest in peace.